Trout flies, by and large, have traditionally been dressed on single fly hooks, commonly up-eyed hooks for dry fly fishing and down-eyed for wet flies. 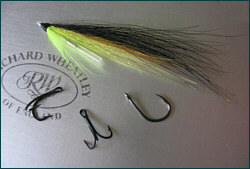 Fly hooks have come in various shapes, sizes and weights .... Limerick bend, Sproat bend, Captain Hamilton, Model Perfect, to mention only a few of the traditional styles. Today, fly tyers have a very wide range of hooks from which to choose, each designed to suit a particular style of fly, imitative pattern or application. The hook bend may be wide or narrow, of fine, medium or heavy wire. The hook point on such fly hooks may be either straight or offset. In theory, the offset bend offers more efficient hooking potential but, in practice, most single fly hooks, regardless of design, will work very well and hook trout efficiently. 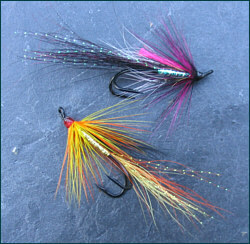 With the exception of wee doubles, once popular on Scottish lochs, trout flies are rarely dressed on anything other than single hooks. Fly hook choice for migratory species such as sea trout and salmon is not quite so straightforward. 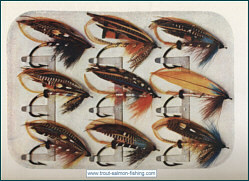 In sea trout fishing, single hooks are still used extensively, both for daytime and night fishing, and very effective they are, too, but many sea trout fishers favour double hooks or treble hooks, used either as dressed flies or, more often, attached to one of a whole variety of specialist night fishing lures such as snakes, needle flies, Waddington lures or tube flies. For sea trout, I like to keep things as simple as possible. I generally only fish for sea trout at night. Flies for night fishing can range from flies dressed on singles as small as size 16 to long fish imitating lures of up to six inches. I, however, rarely use anything smaller than a size 10 single or longer than two and a half inches, the longer lures usually simply and sparsely dressed on a needle or tube, armed with a small double or treble hook. For flies up to about an inch long, I tend to use single hooks. 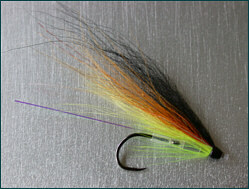 My favourite hooks are Partridge Captain Hamilton in size 8 and Partridge Saltwater Perfect, also in size 8. The Captain Hamilton is a down eyed hook. The Saltwater Perfect hook has a straight eye, which is perfectly fine for fly tying. I tend to turn the eye down slightly before use. There may be no scientific logic in this whatsoever but I have the impression that the knot is less likely to slip to the side when fishing, and the fly lie at an angle, if the eye is turned down. I wouldn't worry too much, though, whether a fly hook has a straight eye, down eye or upturned eye. One benefit of an up turned eye, on a salmon hook in particular, is that it facilitates the tying of the popular Turle knot, which helps the fly lie straight in line with the leader. The Saltwater Perfect hook is a well made hook, slightly longer in the shank than a standard hook and with a nice silvery black nickel finish. With no body dressing, it makes for very simply dressed, fish imitating flies. 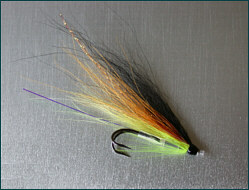 Like many sea trout fishermen, I also like tube flies for night fishing. Flies for sea trout can be dressed on all kinds of tubes, home made or otherwise, in plastic, aluminium, brass, copper, steel etc., allowing us to make tubes of all shapes, sizes and weights each for a different purpose and for fishing on or near the surface, often in the early part of the night, or near the river bed, usually later in the night, although there are no hard and fast rules and practices will vary greatly from one river to another and from one part of the country to another. As sea trout cannot distinguish colours at night any more than we can, we need not worry too much about the colour of our sea trout night flies, except for their tonal qualities. Different colours will be seen as varying shades of grey. 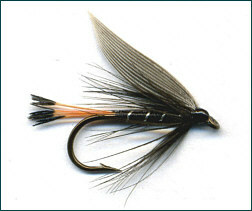 It might be reasonably argued that a simple black fly, dressed on a silver hook or tube, will be as effective as anything for sea trout at night. My favourite sea trout lures are now dressed very simply, in a variety of lengths, on Needle Tubes, ultra slim stainless steel tubes with an outside diameter of only 1.5 mm. Being made from polished stainless steel, the kind used in the making of hypodermic needles, needle tube flies sink more readily than aluminium tube flies but fish a little higher, and more attractively, than the heavier copper and brass tubes. Needle Tube Flies would have a comparable sink rate and similar slim profile to flies dressed previously on Waddington shanks, but with the important benefit that the hook is easily changed on the needle tube fly. Needle tubes are also much easier to dress than Waddington or snake lures. 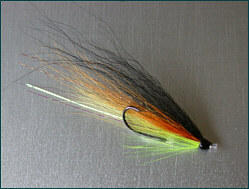 Salmon Tube Flies can be used with single, double or treble hooks. Indeed, a variety of hooks are now sold, by companies such as Loop, Partridge, Fulling Mill and Ken Sawada, specifically for use with tube flies. 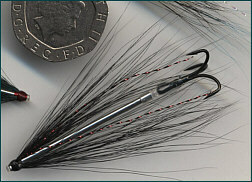 If using a well made treble hook, with all arms of the treble of equal weight, the positioning of the treble will make no difference to the way the fly swims. The treble hook will be in a state of balance, and equally stable, no matter how the arms of the hook lie and will have no natural tendency to rotate to reach a particular position. A treble hook, either dressed or attached to a tube fly, will swim naturally with the bulkiest/most buoyant materials on top.